PETER SCHABEN. While the stories of early settlers in Western Kansas have a great deal of similarity, each one has its distinctive details, and altogether they reflect many instructive lessons in history. There is no better way to understand the essential history of the growth and development of Kansas than through the individual lives of those who bore the heat and burden of the day when only the strong and courageous could survive the difficulties and privations of pioneering. One of these instructive stories relates to the Schaben family, one of whom is Peter Schaben of Bazine, Ness County. Peter Schaben was a boy of about ten years when he came with his parents to Ness County in 1879. Therefore the real story begins with his father, Gerhard Schaben, who passed away here November 6, 1916. Gerhard Schaben was born in October, 1844, in the Town of Stummel, near Breslau, Prussia, Germany. When he was eleven years of age his father, Godfried Schaben, brought the family to America and settled in Wisconsin. Godfried Schaben followed farming in Wisconsin and died in Grant County of that state. His children were: John, who died in Kossuth County, Iowa; Hilgar, who died in Ness County, Kansas; Peter, who spent most of his life in Iowa; Maggie, who married John Coll, and died in Oklahoma; and another daughter was Matilda, who never married. The early education of Gerhard Schaben was largely in the German language. He was brought up on a farm, and gave the best years of his life to that vocation. In Wisconsin he married Miss Gertrude Doerig, who, died May 15, 1918, and their most vigorous and effective years were spent in Kansas. When they left Shelby County, Iowa, in 1879, the family rode in wagons to Western Kansas, and Gerhard took up the homestead where he finally died. When he reached Ness County after an overland journey of several hundred miles his possessions consisted of a team, four cows and $150 in cash. At that he was much better off than many of the pioneers. The first home of the family was a half dugout, about fourteen feet square. He lived there until he could erect a stone house 14 by 24 feet, and this served for a number of years, until it was succeeded by the present two-story stone residence. Though he undertook to farm from the beginning, the climatic conditions were so adverse and uncertain that it was not always possible to make a living off the land. Rather than give up his homestead he supplemented the products of his fields by employment in the harvests of the eastern counties of Kansas, and for about three years he supplemented his farm income by this kind of work. Like other early settlers he had to experiment a great deal in order to find what crops were adapted to the county. This experimentation proved to him that wheat was the most reliable field crop, and this supplemented with stock raising, furnished a reliable source of income. At the same time he always grew enough rough forage for his stock during the winter. Nearly forty years after he came to Kansas, and he was one of the unusually successful men in making good on Kansas soil. His ownership extended to thirteen quarter sections of land, and of that approximately 500 acres are in cultivation. When Gerhard Schaben was at the high tide of his activities as a farmer and stock man he kept from 100 to 200 head of cattle and a large number of horses. Besides his extensive interests as a land holder he was one of the directors of the National Bank of Ness City and had considerable money loaned out over the county. Politically he was a republican voter, served on his school board many years, and was a member of the Catholic Church. 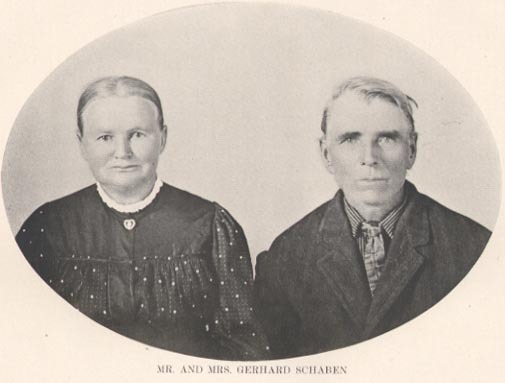 The children of Mr. and Mrs. Gerhard Schaben are: Sophie, wife of Herman Peterselie, of Ness County; Peter; Christina, who died in Ness County, the wife of P. M. Henderson; Annie, wife of Charles Henderson, of Minnesota; Celia, wife of William Davidson, of Ness County; Kate, wife of Frank Raskopf, of Ness County; Maggie, who married Henry Meyers, of Ness County; John, who is a farmer in Ness County and married Verda Ryersee; William, a farmer on the old Schaben home, who married Ollie Carroll; and Gertrude, wife of Jacob Whipple, also of Ness County. Peter Schaben was born in Grant County, Wisconsin, September 7, 1869, and during his early childhood his parents moved to Shelby County, Iowa, and from there they came to Kansas, as above noted. His early education was limited to the advantages of the country district schools. There were no good schools while he was growing up, and more importance was then attached to the work he could perform in the fields and about the farm than to training gained through study of books. Thus his apprenticeship as a practical farmer began at an early age. He lived at home until he was twenty-two, and then married and settled on his present estate. There he proved up a homestead, the Northeast quarter of section 19, township 19, range 21. He also had the sod house experience of most of the old settlers, but it was a number of years ago that the sod house gave way to a better improvement, and he and his family now enjoy the comforts of a modern home, a two-story residence. He also has numerous barns, and every part of his farm indicates the thrift he enjoys. Mr. Schaben has succeeded best as a wheat grower and cattle man, and while not an exclusive dairyman he has marketed more than $15,000 worth of milk. His cattle are the Shorthorn. Beginning with only a quarter section of land, he has added nine other quarters, and is now owner of 1,600 acres. This land is all fenced and cross fenced, 600 acres are in crops, and altogether it constitutes a value which is equivalent to financial independence. His interests also extend to some outside affairs. He is a stockholder in the Farmers Elevator Company of Bazine. Politically he has adopted a different political allegiance from that of his father, and has always voted the democratic ticket. He took the lead in organizing his home school district, No. 82, and has been a member of the board since it was established. In August, 1892, Mr. Schaben married Miss Emma Kueffer, daughter of Godfried and Emma (Lezer) Kueffer. Her father, who was a native of Switzerland, came to Kansas from Wisconsin, and was both a farmer and carpenter. The Kueffer children were: Godfried, Herman, Gottlieb, Otto, Fritz, Rudolph, Mrs. Schaben, Mrs. Hermina Ferris, and Frieda, wife of Oliver Reams of Alexander, Kansas. An inspiration of the hard work which Mr. Schaben has done in making a home and gaining a competence has been the fine household of children, most of whom still remain under the parental roof. The oldest is Hermina, wife of Earl Moore, and they have two children, Harvey and Clio. Flora, the next daughter, is the wife of Urban Cooley, and has daughters Fern and Lavern. The children still at home are named Herman, Wanda, Odessa, Novila, Glenster and Norvel Finley.